People desire a place that can be a refuge from cares of the world – a place for relaxation, contemplation and play. Garden Vision is the Nation’s leader in designing living art with color, texture, sight lines and views in a GardenVisionScape. Garden Vision creates gorgeous designs that enhance and restores ecosystems in outdoor living spaces that become your Restoring Garden for Life. Garden Vision adapts Mother Nature’s color and texture palette which offers infinite variations from which to create living art that are our clients’ outdoor spaces. Whether it’s the rainy Northwest, semi-arid California or Eastern Washington and Oregon, or dry desert or any climate in-between, Garden Vision sees the whole world as a garden. Collaborate with us to create your GardenVisionScape! Garden Vision helps people save the earth by providing intelligent, environmentally responsible landscape designs and horticultural consulting services. This results in enhanced and restored ecosystems while also meeting aesthetic standards through a collaborative design method. Kate Easton is the award winning landscape designer, professional horticulturist and Founder of Garden Vision LLC and Garden Vision Academy. 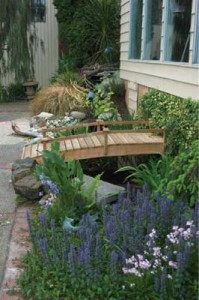 Read more about her Landscape Design Credentials. Garden Vision offers a range of services for consulting and design. 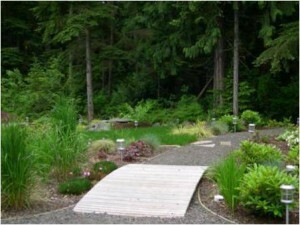 Choose a service to meet your needs from the list of Landscape Design Services. Choose to become one of our many Satisfied Customers! If you are thinking about renovating your landscape, or creating a new look, or just need some expert advise, give us a call today at 360.908.5887, or Contact Us to schedule a consultation. West Valley College Landscape Architecture Student Excellence award in 1990 and 1991. Finalist on HGTV’s ‘Landscapers Challenge’ program (aired 2007). Kate advises clients on ecologically sound horticulture practices, teaches and speaks for community groups. In addition, Kate has been teaching landscape design and horticulture topics in the classroom for over 10 years. In addition to designing gardens, Kate writes about landscape design and horticulture topics for media and in her blog Biophilia. She has authored articles for West Sound Homes and Garden magazine, WSNLA B&B magazine, and has contributed to KPLU’s online feature Think Local/Around the House. Kate is trained in landscape architecture, rain garden design, landscape restoration, plant identification, pruning, plant management and evaluation, landscape maintenance practices, and irrigation design. Kate holds a Masters of Science in Agriculture for which she studied Sustainable Horticulture, a Bachelors in Business, and nearly 40 college credits in Horticulture. Kate is a member of Association of Professional Landscape Designers and Washington State Nursery and Landscape Association. She has earned the WSNLA professional designation, Washington Certified Professional Horticulturist (CPH) and has maintained certification since 2000. In addition, Ms. Easton has been an avid gardener since 1959. 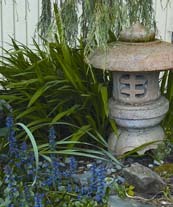 Garden Vision Inc. provides a range of landscape design and horticulture consulting services primarily in Western Washington. See our Landscape Design Services page for complete details of options available. Learn about our qualifications in the credentials section above. Services may be available in other areas upon mutual agreement. All design projects are individually priced (time & materials) to accommodate scope, complexity, effort to complete work, scheduling requirements, and include travel time to the site and/or meeting locations. Projects begin with an initial Consultation meeting so we can discuss project requirements, site assessment and inventory, and your ideas. Written notes are provided for all Consultation visits, regardless of outcome. A retainer and signed contract are required to start all design projects. Initial consultation cost is included in the retainer for design projects. The remainder of the project cost is divided and deliverable at the preliminary review and final review meetings. Individual consulting services are available on an hourly basis (two hour minimum). See the list of available services on the Landscape Design Services page. For consulting services, payment is due upon delivery of service.